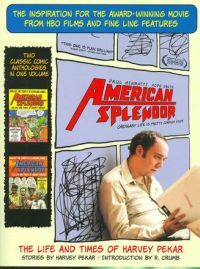 Harvey Pekar passed away a few weeks ago. But fortunately for us, he left half his life behind in ink. There’s too much in this book to go into in detail, and what’s the point, really? Pekar obsessed about his work and its reception enough for any ten critics, and then duly recorded his neuroses about it in his comics. You can’t possibly think Pekar was more of an overlooked genius than Pekar did. Suffice to say it’s still essential reading to show what’s possible with the medium. Though, in these books, what’s possible is not always what’s best: this volume, itself a collection of two collections, begins at the beginning, when Pekar was still essentially writing prose pieces that he could cajole friends into illustrating. The very first vignette, “The Harvey Pekar Name Story,” boasts R. Crumb art on a story that’s barely visual. But as you keep reading–and you will, because even when he’s still grappling with the comic form, Pekar was a born storyteller–the script and the art start to complement each other better until you reach what I found to be one of the most striking single moments in the book. 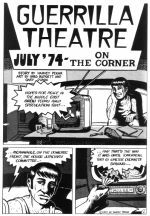 “Guerilla Theatre: July ’74 – On the Corner,” illustrated by Greg Budgett and Gary Dumm, is an 18-page story that rambles and wanders, as all Pekar’s drawn-from-life stories do. The primary action concerns Pekar getting out of the house one evening and checking in with his friend the box office clerk, after which he meets up with two more friends in succession. The three of them leave the theater and eventually help one of the men move some furniture into his new apartment. That takes up the last 17 pages of the story. 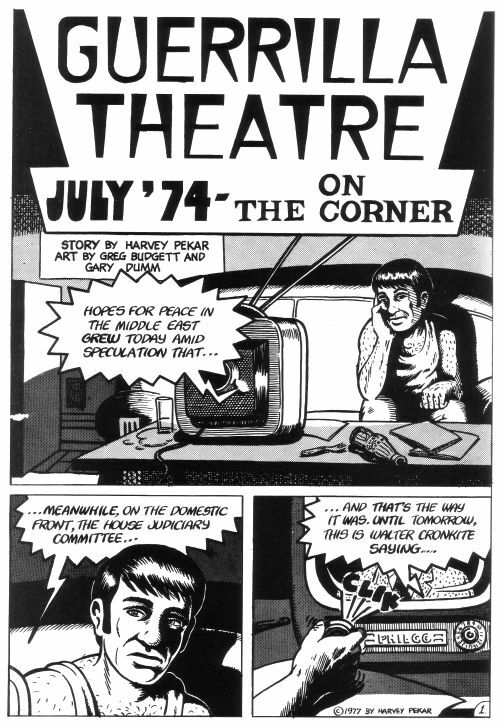 The first page consists of Pekar watching the evening news, featuring reports on the Middle East and the House Judiciary Committee. And the reason I found this striking is because at no point during the next 17 pages–each one of which is basically an illustrated conversation–do either of these subjects come up again. Pekar neither thinks about them nor introduces them into the dialogue. So why is this page in the comic? After wondering about it, it seemed more like a quiet comment on the superficiality of the news. The topics Walter Cronkite discusses, despite their weightiness, have no bearing on the life of an average man in Cleveland, and he has no bearing on them. It’s not that Pekar is ignorant or uncaring; there are plenty of stories in this volume that demonstrate his love for history and his awareness of world politics. But in the course of ordinary life, which is what Pekar primarily documents in his work, these things simply aren’t a factor. The evening news has transformed serious subjects into inconsequential trivia. Now, maybe none of that was intended by Pekar, and maybe his actual reason for including the page was something entirely different. But that’s what you find yourself amazed by, again and again, in reading American Splendor. By presenting the ordinary reality without inflection, he makes us examine and draw new conclusions about things we’d other take for granted. That’s Pekar’s true gift to the world: the ability to see what would otherwise be invisible; the splendor present every day and everywhere. This entry was posted on Saturday, August 7th, 2010 at 11:15 am	and is filed under Comics. You can follow any responses to this entry through the RSS 2.0 feed. You can leave a response, or trackback from your own site.